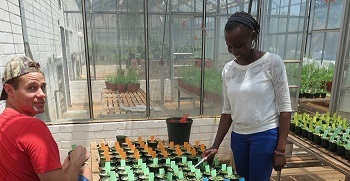 The main objective of the Monsanto/Research Solutions Collaborative Research Programme is to investigate the state of glyphosate-resistant weeds in South Africa, and assesses the plant mechanisms involved in resistance to the world’s most popular herbicide with emphasis on factors affecting weed resistance, and ways to overcome and avoid resistance from taking hold. Conyza bonariensis has been chosen as the first of numerous weeds to form part of this investigative research in glyphosate resistant weeds in the country. In South Africa, three species (C. bonariensis, C. canadensis, and C. sumatrensis) are well known weeds and were first noticed about a century ago, with infestations of one or more species occurring in every province. Farmers’ and agrochemical industry’s experience over many years, and modest scientific investigation in recent years have revealed ubiquitous occurrence, vigorous growth, and strong interfering ability (competition and allelopathy) as characteristics contributing to serious, persistent problems in vineyards, fruit orchards, grain and vegetable crops in many parts of South Africa. Most recent reports of Conyza species in the country have been on Conyza bonariensis, particularly in the Western Cape. The discovery of glyphosate resistant C. bonariensis biotypes in the country was made in that region. Therefore, it was only logical that the quest to survey glyphosate Conyza bonariensis in the South Africa would include this Province. To contextualize this mission, 20 populations from the Western Cape (map, below) were sampled by Prof Charlie in an excursion undertaken from 22nd Feb to 10th March 2013. 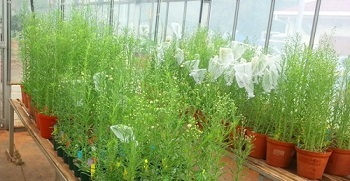 These populations are currently used in experiments conducted by students in the Monsanto/Research Solutions Collaborative Research Programme on various topics surrounding the resistance of Conyza bonariensis to the herbicide glyphosate, under the supervision of Prof Charlie and Dr Juan Vorster.